There are times where I walk out into my garage only to find it packed with clutter. In Arizona its important to your car that you store it in doors or under covered parking. Not only will this help with keeping your paint in pristine condition, no scratches, and it wont be hot when you climb in your car. It’s also important to keep your garage clutter free because of pest’s here in Arizona. They always manage to find a way into my belongings and instead of evicting them, I should just clean instead. Clearing out a garage and going through every box can be time consuming and stressful. 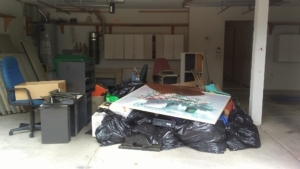 With Vista Clean Junk Removal, we are here to help with decluttering your garage. Whether you have stuff already selected or if you have to go through things while we are throwing things out. We are flexible and willing to work with you to get this task completed. 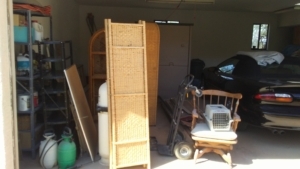 Before Vista Clean comes out for your garage clean out, you need to make sure that you have it all or somethings ready to throw away or donate. Two men will come and help load our 10 or 12 yard dumpster trailer with your desired items you want removed. 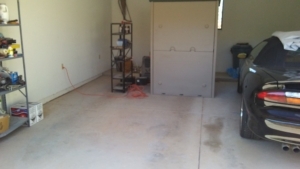 After the process we take the time to sweep out the garage for you. We always want to make sure that every process is easy and stress free for each and everyone of our customers. 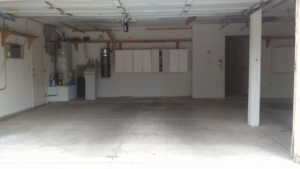 This is the best part of the process, you finally get to relax at home knowing that your garage is clutter free or park your car in your garage. We take the items that we just hauled away and either donate or take it to the dump. If you have donatable items just let us know and we can even get you a tax credit form. What are you waiting for? Call Vista Clean today for all your garage clean out and junk removal needs.